Additional Information: We realize that scrap, junk or wrecked cars, trucks, motorcycles, vans, RV's and other vehicles can clutter your property and even leave you accountable should damage occur. Since 1985, we have helped our customers achieve clean, professional looking properties through our abandoned vehicle and junk car removal services. We cater to all businesses and rental properties, whether commercial or retail, industrial, apartment complexes, restaurants, malls, mobile home parks or other. Scrap or junk cars can be a real eye-sore, giving your property a less than neat and professional appearance. Perhaps you are a retail establishment having problems with individuals parking in disabled spaces, fire lanes or in other areas that create problems. 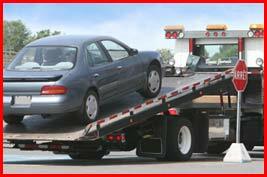 You can depend on fast service and safe towing when you choose Allied Towing for your abandoned car removal needs. Abandoned vehicle towing and impound is big business today; some businesses seem to have repeated problems with junk, scrap or inoperable vehicles being left on their property. Our drivers are trained and experienced, and will remove scrap, junk and abandoned vehicles from your property safely and quickly. We have the equipment to perform the job no matter how small or large; our drivers will also document any violations and photograph the vehicle being removed as a measure of protection. For over 25 years, Arizona customers have depended on Allied Towing for abandoned car towing and impound, and for good reason. We are available when you need us, and never charge you to remove scrap or junk cars from your property. Day or night, 24 hours a day, 7 days a week, you can give us a call and we will respond promptly. Should you have concerns about the property in question, we will ensure compliance with local and state laws. We also specialize in obtaining titles for abandoned vehicles when it is necessary. Abandoned, inoperable and junk vehicles can be a real nuisance. We invite business owners, property management companies and those with rental property to contact us for all of your abandoned car towing and impound needs. Give us a call today; we will get rid of those scrap and junk cars that are detracting from a neat, clean appearance! Towing is what we do - our past customers can vouch for the way we handle all needs in a professional, efficient manner. Picked up an abandoned car at no charge from a property I own in South Phoenix after the renters moved out. Excellent staff as well! Very friendly and helpful, Jeff helped me get rid of my old car that would no longer run, for a great price too! I would recommend Allied Towing to anyone needing assistance with old junk cars and more. I was very satisfied with their service. They were there very quick to help me to tow my disabled vehicle away, In the middle of the night! It is not fun to lose both tires on the busy street. 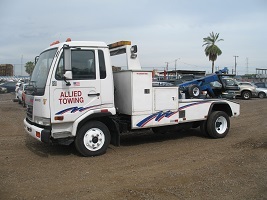 Allied towing was very efficient and friendly. Would highly recommend. Allied came out and picked up a car some one had left in my driveway when I went out of town - Fast response! Working with Allied Towing was a surprisingly pleasant experience. They stayed in communication with me, were fair priced, wise and worked with me during a difficult time. I highly recommend Allied Towing for all of their services because you can count on getting excellent and respectful treatment when you work with them.